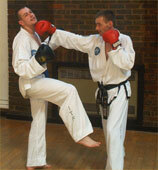 Stuart Anslow is a 4th degree black belt in Taekwon-do and is well known in the UK and internationally. He also runs Self Protection courses for groups associated with his local Council and is Assistant Coach for the Harrow Borough Karate team. Stuart is a full time instructor and was a World Gold and Silver medallist in 2000. Stuart is a regular writer for the UK martial arts press, having written many articles for 'Taekwon-do and Korean Martial Arts', 'Combat', 'Martial Arts Illustrated' and 'Fighters' magazines. In October 2003, Stuart was inducted into the world renowned Combat Magazines 'Hall Of Fame 2003' for his work within the field of martial arts on a worldwide level. There are many preconceived notions on what is and what is not part of the Ch'ang Hon system of Taekwon-do. These are brought about by instructors or associations teaching what and how they want, which is not in itself wrong, but it does confuse the student sometimes. Here we explore some of those myths as well as listing what makes Taekwon-do different from other styles, especially its father art, Shotokan Karate. Taekwon-do is often cited as being mainly a kicking art, but in actual fact is has many more hand techniques than kicks, at a guess I would say the hand techniques out number the leg techniques by around 8 to 1 (I once read there are over 2000 hand techniques, but I've never actually counted them to verify this). W.T.F. (World Taekwon-do Federation) Taekwondo helps proliferate this argument, with its competition format scoring on virtually kicking techniques alone. I.T.F. competition does the same thing although it scores hand techniques more readily, kicks score more as they are considered harder to perform. I.T.F. competitions want to promote this spectacular side of the art as it often looks better than a slug fest using just the hands and shows part of the technical expertise and grace that many Taekwon-do performers have. There is nothing wrong with this and in the main I agree with how I.T.F. based competitions are run; as I too enjoy seeing the kickers perform. However, this is competition and many students and especially those who do not train in Taekwon-do can't dissimilate 'this is competition' from 'this is Taekwon-do'. Other connotations about Taekwon-do due to its sport side are abound, mostly from other ill informed martial artists, but if we do nothing to change their views, including via our training methods and they do not delve deeper than what they see in a magazine or on a video, this misrepresentation will persist, as its up to the instructors not the student. This is a fallacy born from the semi-contact form of ITF based competition. In ITF competition sparring, contact is suppose to be controlled, though in many of the competitions I have been in as a black belt, the contact levels have varied between medium, to hard, to occasionally full contact. The difference is the rules. The actual rules for ITF competition state 'light contact' and it is really up to the judge to enforce it. I have never gone into a fight in an ITF based tournament and deliberately gone in with heavy contact. The problem stems from the referees not enforcing rules properly and thus, if an opponent went heavy on me and the referee didn't pull them up, then I had no choice but to give as good as I got. Those outside of Taekwon-do simply see ITF based competition, with two opponents skilfully controlling their techniques (and it is a skilful opponent that can fight fast and intensely and still control their techniques, as those less skilled rely simply on brute force) and summarize that this represents Taekwon-do as a whole. The fact that in many dojangs, competition sparring is the only sparring helps further promote this. My good friend from Poland, Piotr Bernat, has told me that most Polish competition sparring is heavy and full contact and unlike WTF sparring, allows punches to the head (Competitors wear the same protective equipment as in any standard ITF based tournament) so even in competition, its not strictly true. Competition aside, in training I have had many heavy contact sessions with fellow black belts. Seniors in my classes spar from light to medium to heavy contact and are also allowed to use take downs, sweeping, low kicks, trips and throws at the same time, depending on the type of training we are doing. Hosinsol is often performed with techniques at full power, but stopped short to avoid injury. Obviously one cannot strike full contact to a vital point as it would cause major damage to a fellow student, however the strikes are thrown at full speed and intensity and blocks are often utilized at close to full power unless hitting a joint or vital point. The pattern applications show the full contact state of Taekwon-do. Techniques are designed to maim, kill or destroy an opponent and without full power, this cannot be achieved, hence why patterns practice and more so, patterns practice with visualization, is so essential to maintaining this element. Another fallacy born from competition only sparring. Students are geared to think they must always kick above the waist. And whilst this is a good criteria for children, beginners and junior grade students, due to their lack of targeting skills and control, it is not such a major issue to a more skilled student who can chose when to hit hard, where to strike and when to pull a technique for safety. The problem exists and many clubs these days are so competition orientated that they are never allow to blossom into this area which is vital for a full rounded arsenal of techniques. The patterns themselves contain low kicks, so students should be allowed the freedom to train in areas that overlap. Patterns, sparring and hosinsol (self defence) all overlap onto each other forming what is really Taekwon-do, as each on their own are just parts of the whole. Again, another myth perpetrated by competition and further enforced by schools that only concentrate on competition sparring. Sweeping is as much a part of Taekwon-do as kicking is. Again, even in controlled sparring, sweeping can be practiced by more senior students. Again, the patterns incorporate sweeping techniques, some which are obvious and other which are not so obvious. Taekwon-do contains many locks (and breaks) if we study properly. Early in its development Taekwon-do incorporated elements of another Korean art, Hapkido, including many of its joint locks. However, someone deemed much of them either too long, too complicated or not instant enough so they were discarded and those that were kept centred around being quick to apply or causing a break and not just a lock. Many locking techniques can be found within the patterns. The encyclopaedia of Taekwon-do published by General Choi contains a whole section on throwing and falling. This section contains throws such as hip throws, body drops, even the classic inner thigh throw. If it's not being taught to the student, it's not because it is not part of Taekwon-do. Deeper inspection of the patterns also reveal many throwing techniques as you will discover. 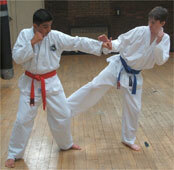 Contrary to what you may see in some Taekwon-do schools, Taekwon-do contains no weapons. No weapons training and no weapons patterns. These are extra parts brought in from the outside by instructors, some as a means of enhancing their students' knowledge in martial arts, but often as a means of hiding their lack of deeper knowledge and often as is the case these days, simply to charge the students more money. Taekwon-do was an art designed for soldiers and soldiers carry guns. Taekwon-do was there if they couldn't use their gun (rifle or bayonet) for one reason or another, they didn't carry poles and sticks just in case they dropped their rifles. However, Taekwon-do contains what I like to term 'anti-weapons' techniques and training. These are techniques and applications specifically designed against weapons such as knives, clubs, sticks, poles, bayonet attacks and even against pistols. Many 'anti-weapons' applications are found within the black belt patterns though a student gains an introduction unwittingly as early on as Joong-Gun tul. All the above 'Taekwon-do doesn't contain.' myths are due to a lack of knowledge in certain areas by instructors or simply because instructors left whomever they were with before gaining a full appreciation of the art. Many modern Taekwon-do books further support this myth by not showing or even mentioning them. Many students are lead to believe that patterns are simply a form of practice for balance, fitness, poise, technique, smoothness and other reasons, totally disregarding the self defence aspects. Though when asked to recite the definition of Tul (Patterns) they happily stand there and say "Tul is a series of offensive and defensive movements set in a logical sequence against one or move imaginary opponents."! This is the standard definition of patterns that virtually all students give but still it is ignored! A series of offensive and defensive movements sounds like self defence to me! The word 'opponents' also implies the same! In the Encyclopaedia, General Choi states 'Patterns are various fundamental movements, most of which represent either attack or defence techniques, set to a fixed or logical sequence'. 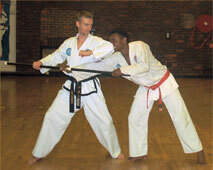 He further goes on to mention the other benefits of practicing patterns, but before the extra benefits, it is stated that patterns represent self defence techniques, set out logically to aid the students practice, meaning the foremost purpose of patterns, is the practice of self defence. Besides, does anyone really think someone would spend forty plus years developing a system for balance, poise etc and via so many exercises (i.e. the 24 patterns)! This is further enhanced by instructors and organisations, especially in regards to competition and the emphasis placed on technical merit to win gold medals. The spreading of Taekwon-do around the globe also has a part to play in this, as General Choi's first concern was uniformity and this is the way pattern seminars have been conducted the world over, with little of no time being given to the self defence value. Aside from the definition of Tul, which clearly states that patterns are a form of self defence, I cannot really believe that General Choi spent over forty years creating something for historical purposes only. In relation to the above, many feel they are unrealistic and these reasons have led to the conclusion by some groups or instructors that the usage and practice of patterns are for no more than historical purposes, allowing them to spend less time on them and more time on getting ready for tournaments etc. As a side note, General Choi was opposed to tournaments as he felt they didn't show Taekwon-do in its proper light and that parts of the art have to be changed or forfeited to ensure the safety of the participants and to a large degree he was right. Pattern performances really only show the shell and from that, no one can tell if the egg inside is good or bad or even if it has yolk at all! The focal point of patterns training today is to excel in tournaments and the same is true with regards to sparring being totally tournament based in many clubs - is it any wonder the more underlying benefits of patterns have been almost phased out! Personally, I had a good tournament career and feel they are both enjoyable and beneficial to students. They even contain a few elements that overlap fighting or self defence and are beneficial to this area as well, like adrenaline management and confidence. But, competition sparring is not fighting and training patterns solely for competition ensures the student misses out on the real purpose of patterns and doesn't allow the student to develop this area any further than stage 1 of patterns training. Well they are if they are looked at in that way and have no self defence value above learning techniques and how to distribute power into them, but as you will see, this is not the way it should be, was meant to be, or has to be! Though this is debatable depending on what you term sparring, as it is largely based on the assumption that all Taekwon-do sparring is performed like competition sparring. It also pertains to sparring being confused with fighting or self defence, but as any self protection instructor will tell you, competition based sparring is far removed from either self defence or fighting. Competition sparring is just that - for competition. Traditional 'all in' sparring allows greater use of the patterns movements, especially the ones listed in this book, and is more akin to fighting than competition, but is still not the exact environment where patterns are most suited as you will see. This is also discussed in depth in my book "Ch'ang Hon Taekwon-do Hae Sul: Real Applications To The ITF Patterns". Some 2000 years ago, Cicero, a Roman orator listed the '6 Mistakes of Man'. Number 3 was 'Insisting that a thing is impossible because we cannot accomplish it.' It is therefore feasible that though some may see little or no value in the training of patterns it could simply be because they were unable to make them work for them or more likely, were not willing to invest the time and effort to do so, deciding to quit patterns practice to concentrate on areas they felt were more beneficial. This is not to say they were wrong, it was their path, it is however wrong to denounce something just because you personally see no benefit in it, even when others do. Others simply 'talk the talk' of their instructors without ever actually knowing themselves as they have started an art that has this ethos. History however, speaks for itself, as for every credible instructor that denounces patterns as not working or as dead training, there are hundreds or more acknowledged masters and highly regarded students that went before them, that saw them as the complete opposite, enthused their benefits and trained them to extremes, many of these masters are legends in the history of martial arts but others still live and breathe, putting into practice everyday the benefits of their arts patterns or kata, in fact, one of the senior police trainers in Okinawa is an expert in kata applications and this is how he teaches the officers under him. I have yet to hear of a highly accomplished patterns or kata master, suddenly denouncing the training of them and if they did, this would carry far more weight in my mind than someone who has never placed a concerted effort into patterns study or effort in training that area in the first place. Only one who has in-depth knowledge of something in the first place can denounce it as useless! The problem is that often, due possibly to the reasons mentioned above, that the patterns are not studied or taken to the depth of training that they could be. Students reach 1st or 2nd dan and feel they are advanced, whereas 1st degree is just the start of training, meaning the student has a good grasp of the basics. The student then feels that patterns are repetitive, or wonders what's the point of simply learning new sets of movements with no basis and drifts towards competition or sparring and finally feels they are a waste of time and effort, simply doing them because they are a student in a Taekwon-do class, to prepare for tournaments or in order to pass their next dan grade. For some students, this is often short lived as they decide their time could be better served in other areas of training. All this can be rectified by following the training methods detailed in my book "Ch'ang Hon Taekwon-do Hae Sul: Real Applications To The ITF Patterns" and a new appreciation of the patterns can be gleamed, as the real benefits of pattern training becomes apparent. Reproduced from the book "Ch'ang Hon Taekwon-do Hae Sul: Real Applications To The ITF Patterns" with permission specifically for Iain Abernethy.